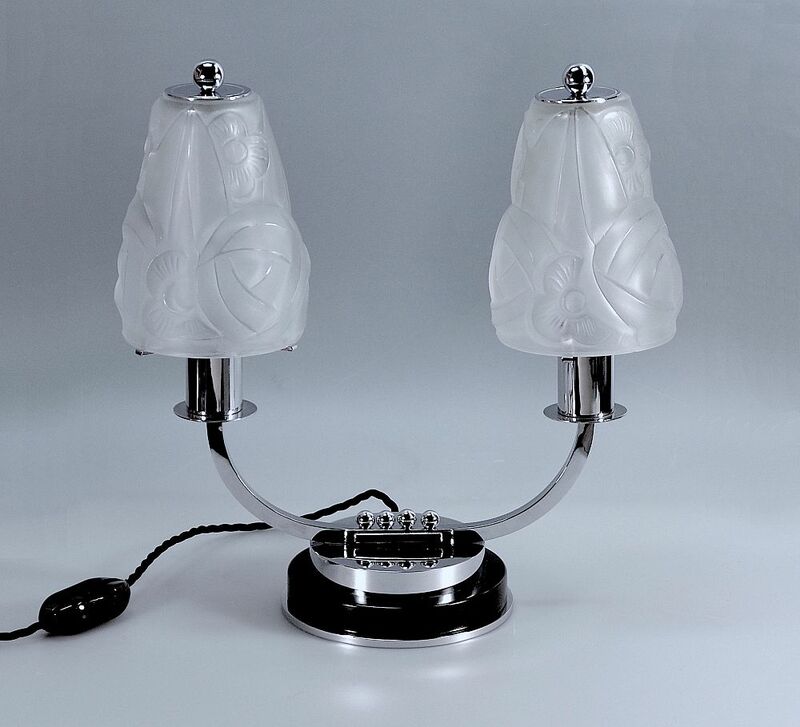 This very handsome lamp was made during the Art Deco period in France. The round base consists of three tiers, the bottom tier is a round chrome disc leading to the middle round tier which is black lacquered wood. The top tier is a round chrome section attached to which is a square boat shaped branch arm with four round chrome balls in the centre. At the end of each branch arm is a round chrome disc supporting a chrome cylindrical bulb holder cover. A removable chrome triple arm sconce fits into the top of the cover and holds the Degue press moulded glass shade. The shades are decorated with towers and geometric patterns and are topped with a round chrome disc with a chrome sphere. The shades are signed "Degue".